As students face the pressures of midterm season leading up to spring break, a Yale campaign is encouraging University community members to reduce both clutter and stress in their lives. Starting Monday, students will have a new late-night dining option at the Joseph Slifka Center, which will offer dinner from 5 p.m. until 9 p.m on Monday through Thursday nights. To view the message, please click here. On Sunday night, hundreds of Yale community members gathered at the Women’s Table to mourn the victims of Saturday’s Pittsburgh synagogue shooting. The Joseph Slifka Center for Jewish Life at Yale is celebrating the High Holy Days this year under new leadership. In addition to the appointment of Uri Cohen, the new director of the center, the Slifka Center has added six new positions — mainly staff and clergy — to improve the center’s day-to-day operations. NEW HAVEN – Uriel Cohen, the new executive director of the Slifka Center for Jewish Life at Yale, fondly remembers the time he spent at Hillel when he was a student at the University of Pennsylvania. “I went to visit Penn…and absolutely fell in love with Hillel first and Penn second,” he recalls. “It was really the community – the whole feeling of being in a tight-knit Jewish community for the first time in my life. And it was tremendously important – I don’t over-exaggerate in any way when I say that everything that I have accomplished in my professional career is because of what I learned about myself at Penn Hillel. 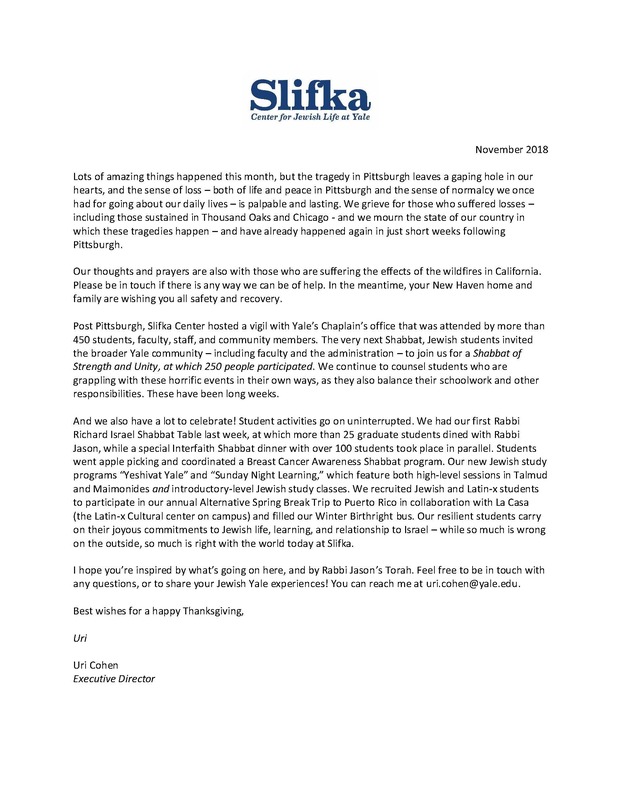 “It was and continues to be a phenomenal place, though it is about to be eclipsed,” he laughs, referring to the Slifka Center and his plans for the Jewish campus organization. Uriel Cohen, an experienced Hillel administrator, will serve as the next executive director of the Joseph Slifka Center for Jewish Life and Rabbi Jason Rubenstein will take over as Jewish chaplain, Slifka’s board of directors announced in community-wide emails last month. When they begin work later in August, Cohen will succeed Peggy Gries Wager ’82, who has served on an interim basis for the past year, and Rubenstein will fill a position that has remained vacant since the abrupt departure last summer of Rabbi Leah Cohen, who worked as both executive director and Jewish chaplain.